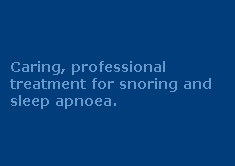 Non-Surgical Treatments - Professional treatment for snoring and apnoea. Over the years, many ideas have been presented as "cures for snoring". Various types of pillows, nasal sprays, chin straps, exercises and even 'throat lubricants' have been promoted as effective non-surgical solutions. Recent innovations have included technological marvels such as vibrating wristbands which are activated by the noise of snoring, and deliver a shock or vibration to the wearer. These assume a snorer can be 'trained' not to snore. Even when they reduce the amount of snoring, the problem with this treatment is obvious … the snorer is reducing their snoring only because they’re being constantly woken. Generally, the low price of these items makes them seem attractive, especially since there is no requirement to visit a doctor before commencing 'treatment'. Unfortunately, sleep disordered breathing is a serious and complex problem and not generally something which can be treated properly on a ‘Do It Yourself’ basis. Be wary. If something seems too good to be true, it probably is. Adults who suffer from mild or occasional snoring may gain relief through a combination of the following self-help remedies.They are certainly worth trying before resorting to painful and/or expensive treatments. Adopt a healthy and athletic lifestyle to improve muscle tone and shed weight. (Note: If you are unfit, a male over age 40; a women over 50; if you suffer (or are at risk of) chronic health problems such as heart disease, diabetes, or obesity, you should consult your doctor before beginning an exercise program). If you have allergies that cause nasal congestion, oral or nasal sprays are available from some pharmacies or on the internet. These sprays can be effective in the short term but cannot be used on a long-term basis. If your nasal congestion doesn't clear up in a few days, see your doctor as you may need stronger medication, or other measures to clear your nasal passages. The Continuous Positive Airway Pressure treatment was developed almost 20 years ago by Professor Colin Sullivan in Sydney, Australia. 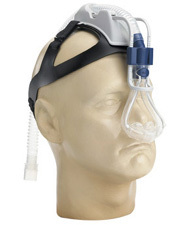 With the exception of some patients with severe nasal obstruction, CPAP has been found to be nearly 100 percent effective and so it is generally considered to be the 'Gold Standard' for the treatment of sleep disordered breathing, especially severe obstructive sleep apnoea. 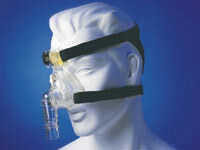 CPAP delivers air into the airway through a specially designed mask which is attached to a pressure pump. The mask/pump is designed to force air into the airway so that it won't close. Not surprisingly, many people find wearing a mask in bed every night difficult to tolerate. Some patients (or their bed partners) are unable to tolerate the mask, the hoses and/or the noise of the air pump and decide to cease using it. As a result, numerous studies have shown that long­ term compliance in using CPAP is lower than 50%. That is, approximately 50% of SDB sufferers prefer to suffer from the ailment rather than the treatment because they find the device to be claustrophobic, or because they have difficulty using it when travelling, or because it is too intrusive and disruptive of their relationship with their sleeping partner. Suitability for CPAP use is determined after a review of your medical history, lifestyle factors (alcohol and tobacco intake as well as exercise), cardiovascular condition, and current medications. You will also receive a physical and otorhinolaryngological (ear, nose, and throat) examination to evaluate your airway. Before beginning to use the treatment, you would need to have the proper CPAP pressure set during a formal sleep study. This will require an overnight stay in an accredited sleep study centre. The oral appliance therapy provided by The Sleep Therapy Clinics has been successful for many patients who previously tried CPAP but were unable to tolerate it. Specialist sleep physicians are increasingly recommending oral appliance therapy as a 'first line' treatment for sleep disordered breathing, because the patient can always 'upgrade' to the more intrusive and expensive forms of treatment if necessary. Oral appliance therapy is also commonly used by CPAP users for those occasions when they need a highly portable solution, or when the power supply to run the air-pump is not readily available (for instance, when travelling, camping or boating.) Oral appliance therapy is also a good back up treatment in the event of power failure. During the 1980’s, most physicians tended to believe that CPAP was the only viable treatment alternative to surgery. 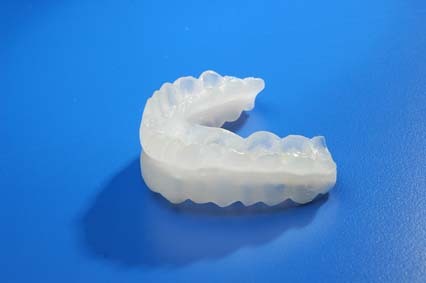 Significant studies included the 1995 American Sleep Disorders Association Review titled “Oral Appliances for the Treatment of Snoring and Obstructive Sleep Apnea”, and the Academy of Sleep Medicine report titled “Practice Parameters for the Treatment of Snoring and Obstructive Sleep Apnea with Oral Appliances”. In addition to these advantages, professionally prepared appliances are less expensive than surgery or CPAP treatment. The appliances are also highly transportable and do not require any form of electrical power, which is a significant advantage over CPAP therapy and particularly important for anyone who travels. Oral appliances come in many different shapes and forms – but while the appliances can vary in design, they all have the same purpose in the end; namely, to assist in maintaining an open airway for the patient while they sleep. 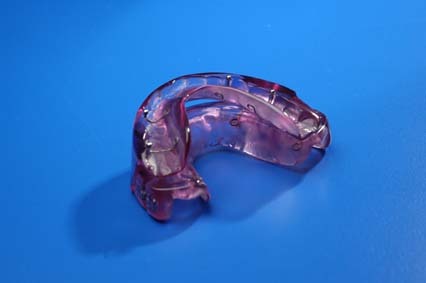 In most cases, the appliance is an orthodontic retainer (similar in some ways to a mouthguard) or an orthodontic splint (a removable plate with wire attachments which fit over the teeth, similar to dental braces). In both cases, these appliances fit in the patient’s mouth and position the lower jaw forward to open the airway during sleep. When properly custom-fitted by qualified and specially trained dentists, and when constructed by properly trained and specially equipped prosthetic and technical staff in specially equipped dental laboratories, the appliances are completely comfortable to wear. The patient need simply place the appliance into their mouth before going to sleep and then remove it in the morning. The principle behind this treatment is not new. Records show that the first oral appliance to keep the lower jaw forward and assist in airway dilation was used back in the 1930’s. However, mandibular repositioning oral appliances have only recently been widely available and used. 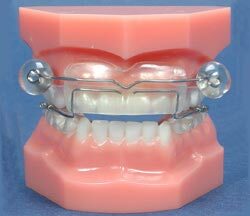 A recent study in Switzerland found oral appliances highly effective in treating sleep apnea. A similar study in the UK of 25 heavy snorers found that use of mandibular advancement appliances was effective in reducing snoring loudness for 84 per cent of the subjects while 76 per cent said they were snoring on fewer nights per week. The treatment pathway developed and used by the clinical staff at The Sleep Therapy Clinic achieves even better results. Our success rate is closer to 100%. Most patients tolerate professionally prepared appliances exceptionally well, taking less than a fortnight to become completely comfortable sleeping with the appliance in the mouth. Some side effects have been noted in some cases, although these were described as being only "mildly disturbing". Listed side effects were mucosal dryness, tooth discomfort, jaw soreness, and excessive salivation. These side effects usually passed within a few hours of waking and removing the appliance. The symptoms usually passed completely in well under 3 weeks. In the interim, some particularly sensitive patients chose to use simple pain relievers (aspirin and paracetamol) to gain relief from the tooth/jaw discomfort. Professionally prepared oral appliances are now a recognised treatment for snoring, sleep apnoea, and upper airway resistance syndrome. This is highlighted by the fact that the Federal Drugs Administration recently upgraded its classification of the treatment. Many designs of MRD’s exist, including some ‘over the counter’ or ‘via the internet’ do-it-yourself versions, but it is universally recognised that it is essential the appliances be individually designed and custom fitted for each patient by qualified professionals in order to be optimally effective. As an example, at The Sleep Therapy Clinics, treatment with oral appliance therapy requires (as a bare minimum) the involvement of specially trained dentists, specialist sleep physicians, and dental prosthetistic or technical staff working in professional laboratories. Advanced assessment and diagnostic procedures and equipments are used to determine the optimal shape and position for the devices. The custom making process takes up to 3 weeks to complete. This degree of accuracy simply cannot be matched by someone trying to fit an appliance themselves in their kitchen. Professionally manufactured devices are very hard wearing and should last up to 3 years.